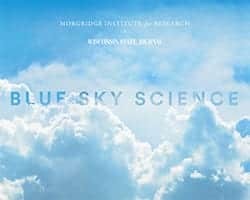 News & Stories > Blue Sky Science > How many molecules are in a cubic inch? Each molecule has a different size, so that determines how many would fit in a cubic inch of space. One cubic inch of water contains about 5×10^23 molecules. That means a five followed by 23 zeroes. If you were looking at a cubic inch of sugar, that would contain 5×10^22 molecules, so a bit less than water but still a very large number of molecules. Imagine the thickness of a strand of hair. If you were to lay water molecules across the thickness, you could fit around one million molecules. That’s how small molecules are. Researchers can use microscopes and other techniques to look at a single molecule at a time. Single-molecule research can be powerful because you can see the differences between molecule A and molecule B and compare how different molecules are behaving. Scientists can use a phenomenon called fluorescence to do this work. A fluorescent molecule called a fluorophore is attached to the molecule being studied. You can think of the fluorophore as a flashlight. A laser is required to essentially “turn on the flashlight,” turn on the fluorophore so it emits the light. This helps illuminate the molecule scientists are interested in so they can see it under a microscope. What determines the melting or boiling point of a substance?